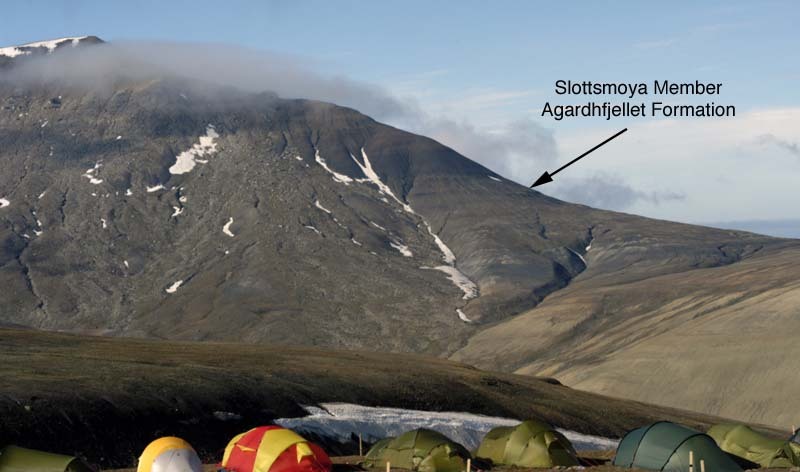 There has been a spate of reports in the media recently about an important find of marine reptiles from the Svalbard, in the Norwegian arctic. The largest island in this archipelago is Spitzbergen. Fragmentary remains from this area have been reported for almost a century (Wiman 1914). However, these have been only of isolated elements. The number and fine preservation of these newly announced specimens makes this a very important locality, and one which may add greatly to our knowledge of plesiosaur anatomy and evolutionary history. The expedition of 2006 was primarily to record the location of these specimens. In 2004 two partial plesiosaurs (probably Kimmerosaurus) and one ichthyosaur skull were collected. In the same area about 10 other specimens were located, but due to problems with the rights to the fossils in the area they are not mapped properly or excavated. 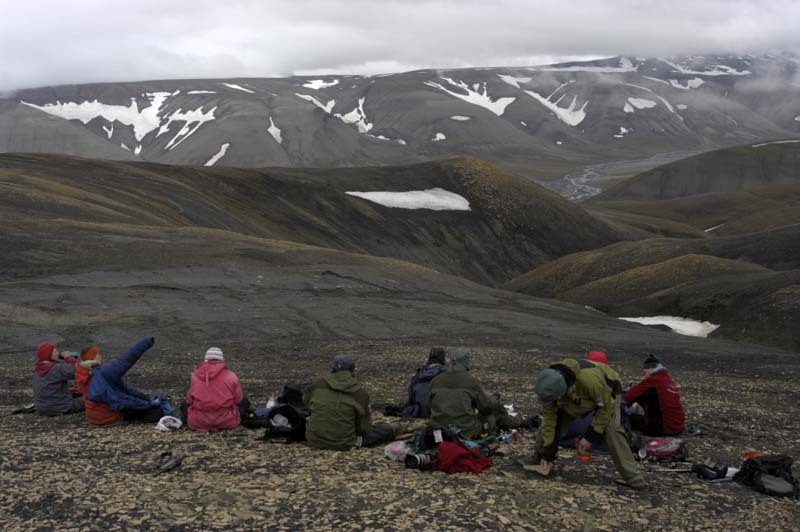 In 2006 focus was moved to an area owned by the Norwegian government with the same stratigraphic level exposed. So far 21 plesiosaurs, 6 ichthyosaurs and the large pliosaur have been mapped in this area. 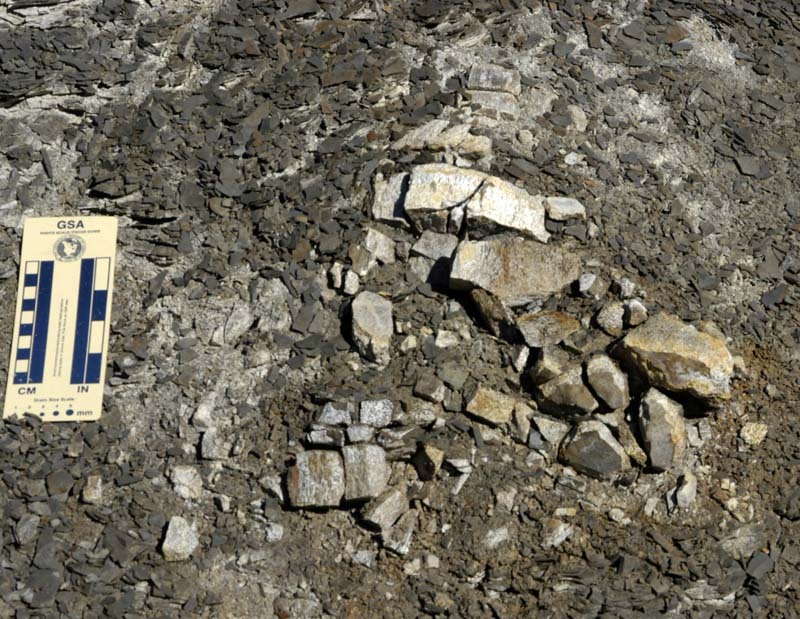 The fossils are partly embedded in permafrost, so excavation will be challenging. Of the specimens, nine are in situ and worth excavating - which is not bad for seven days of prospecting. It is planned that the specimens will be excavated on expeditions over the next few years. A short video clip which shows some of the fossils, the site and its surrounding area can be found here. It is mainly in Norwegian, though there is some English commentary by Pat Druckenmiller. When the screen is red, it's because it's showing a clip of Liopleurodon from the BBC's 'Walking with Dinosaurs'. High resolution images of the area and the excavation can be found on the University of Oslo's web site here. Stratigraphically, the specimens are found in the Agardhfjellet formation, Slottsmøya member (Dallmann 1999). This is dated somewhere between the upper Bathonian and the top of the Jurassic, and possibly contemporary with the Kimmeridge Clay Formation of Southern England and North-West France. This is well known for its marine reptile fauna, and appears to be similar in terms of the plesiosaurs and ichthyosaur taxa to this newly discovered fauna. So far none of the other taxa found in the Kimmeridge Clay, such as turtles, fish, marine crocodiles and pterosaurs have been found. Given the limited time spent in the locality, it may simply be that they are harder to spot, and that it takes a while for the eye to become accustomed. The specimen which has gained most attention is what may well be a substantially complete individual of the large pliosaur, Pliosaurus. Only the tip of the snout, some teeth and stray vertebrae were collected during this summer's expedition, and it is planned to excavate the remainder next year. The teeth are trihedral in section, and that together with the large size suggests that the identification as Pliosaurus is probably correct. However, more anatomical details are needed to be certain, in particular the nature of the mandibular symphysis. Other plesiosaur specimens include two partial skeletons identified as Kimmerosaurus on the basis of cranial material. The Oslo University web site posts an image showing one of these specimens being excavated in 1994. Kimmerosaurus is known only from skull elements and a few anterior cervical vertebrae. Another genus from the Kimmeridge Clay, Colymbosaurus, is known only from post-cranial elements and there is good circumstantial evidence that the two taxa are in fact one and the same. If these specimens include both cranial and post-cranial material, it could confirm this. However, if Kimmerosaurus is Colymbosaurus, the latter name takes priority - a pity, as Kimmerosaurus langhami is named after it's finder Bob Langham, an old friend of mine who was highly influential in developing my interest in fossils. The estimate of 10m length for the pliosaur based on a 2 meter long skull is reasonable. We don't know much about pliosaur post-cranial anatomy, but from the few substantially complete specimens we do have, it looks as if the head was large relative to the body. A body length 4-5 times the length of the skull is in line with other large pliosaurs. Reports of the skull being 3 meters long are obviously an exaggeration, but such a size is known from other large pliosaurs. I have little doubt that the animal will become bigger and fiercer as reports filter through the media - a process I called "godzillaization" in reference to the Aramberri pliosaur! Although this is possibly the most complete specimen of Pliosaurus , there are specimens of other large pliosaurs which are substantially complete and articulated. A skull of Pliosaurus is on display in Bristol Museum. (see Taylor &amp; Cruickshank 1993, Taylor et al 1995)This is one of two partial skeletons in the museum collections. I should add that any comparison to Tyranosaurus rex is inappropriate: these animals made T.rex look like a kitten! Many thanks to Magne Høyberget, Jørn Hurum and Pat Druckenmiller for information about this wonderful locality, and to Tommy Tyberg for bringing historical references to my attention. The photographs are courtesy of Pat Druckenmiller.